I'm the third five15 Composer in Residence with the incredible London Oriana Choir. Read more about it on the choir's website here. 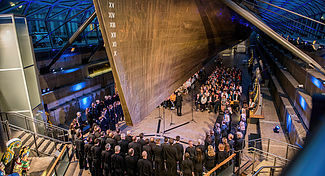 I'm writing three pieces over the course of the year – a Christmas composition which premiered in December 2018, an work for choir, piano and percussion and a final a cappella piece which will receive its première at a concert at Cutty Sark in the summer of 2019.
five15, is the commissioning of 15 brand new choral works from fivewomen over the next five years, but it will also include a programme of new performances, educational projects, recordings and other initiatives to raise the profile of classical music written by women across the UK, as well as helping to encourage and develop the talents of new young writers.